We’d love your help. Let us know what’s wrong with this preview of The Lost Years of Merlin by T.A. Barron. When Merlin, suffering from a case of severe amnesia, discovers his strange powers, he becomes determined to discover his identity and flees to Fincayra where he fulfills his destiny, saving Fincayra from certain destruction and claiming his birthright and true name. To ask other readers questions about The Lost Years of Merlin, please sign up. Richard It is explained later in the series. In the Wings of Merlin. Does this remind anyone of Disney's The Black Cauldron (based off the books series by Lloyd Alexander)? George They're both coming-of-age stories riffing on Welsh myth. Some similarity is inevitable. I remember reading The Lost Years Of Merlin series when I was in Middle School. From what I remember, I LOVED them and decided to re-read them now, over 10 years later. I still enjoyed the book, but did not find it as amazing as I did when I was little. Emrys does not know who he is, who his parents are, or what his real name is. After a terrible fire that leaves him almost blind, Emrys sets out to sea to find where he belongs. He finds himself in a terrible storm and is washed onto a shore, half I remember reading The Lost Years Of Merlin series when I was in Middle School. From what I remember, I LOVED them and decided to re-read them now, over 10 years later. I still enjoyed the book, but did not find it as amazing as I did when I was little. Emrys does not know who he is, who his parents are, or what his real name is. After a terrible fire that leaves him almost blind, Emrys sets out to sea to find where he belongs. He finds himself in a terrible storm and is washed onto a shore, half drowned. Emrys learns that he is on an island named Fincayra and when his first friend gets kidnapped by warrior goblibns, Emrys and his miniature giant friend Shim set out to the Evil King's castle. On this journey, Emrys not only discovers much about himself, but also a great amount of his past. - The description throughout the book. I could literally see and feel everything, I felt as though I were standing beside Emrys throughout his entire journey. - The character development. Emrys was not the only character that evolved through the story, which was nice. - Re-visitng old characters that I have not seen in years. The Grand Elusa, Domnu, Rhia, Shim, Trouble, I've missed them all and think of them fondly in memory. - The battle in King Stangmar's castle. So epic, leaves you drooling for the sequel. - The description throughout the book. I know this is also listed as something I liked, but it is also something that bothered me. Some chapters were complete visual, which was slightly annoying. Nothing progressed in these chapters, just a long winded explanation of the setting. - How slow Part 1 was. It really dragged and made me wonder how enthralled with the series I was when I was little. How did i get through Part 1 without putting it down? Não consegui interessar-me por esta história. Tentei, ainda cheguei à página 191 (! ), mas desisto. Tudo muito déjá-(l)vu, e uma escrita que não consegue prender-me - o que pode dever-se, em parte, à tradução (de vez em quando, há frases que não fazem muito sentido). Recomendado apenas a adolescentes que queiram iniciar-se na fantasia. I just couldn't become interested in this story. I tried, I got to page 191 (! ), but I give up. It's all very déjá-(l)vu, and I can't connect with the writing - the translation may be to blame, partially at least (some phrases don't seem to make much sense). Too much description for my taste.If there's one thing I don't like it's a book whose plot is really good but has too many unnecessary descriptions.I don't really care how the sky looked when Emrys woke up or how the grass smelled when he traveled.I kind of liked Shim,but Rhia is a different story-you know I'm not a fan of insta-connection between characters.I'm also not liking the fact that Emrys saved his cruel father but left his mother easily.I mean,the woman took care of yo Real rating; 3.5. Too much description for my taste.If there's one thing I don't like it's a book whose plot is really good but has too many unnecessary descriptions.I don't really care how the sky looked when Emrys woke up or how the grass smelled when he traveled.I kind of liked Shim,but Rhia is a different story-you know I'm not a fan of insta-connection between characters.I'm also not liking the fact that Emrys saved his cruel father but left his mother easily.I mean,the woman took care of you for so many years at least you can do is pay her some respect. Overall,not so bad but not so good. Sevdim ben bu çocuğu. Daha sonra büyük halini de okumak istiyorum. Bir yerde epey şok oldum. Unuttum mu yoksa hiç mi bilmiyordum emin değilim. "Hidden. The whole world is hidden." This fiction book full of turning events that you wouldn't have imagined that could have happened. I think this book is really good book. I enjoyed reading this book, i found it interesting, every turning page there was something exciting, and interesting. ***SPOILER ALERT*** Emrys and Branwen washed up on shore to an unknown place. Emrys was in pain and he couldn't remember anything. He couldn't remeber who he was or how he had gotten there and he couldn't "Hidden. The whole world is hidden." This fiction book full of turning events that you wouldn't have imagined that could have happened. I think this book is really good book. I enjoyed reading this book, i found it interesting, every turning page there was something exciting, and interesting. ***SPOILER ALERT*** Emrys and Branwen washed up on shore to an unknown place. Emrys was in pain and he couldn't remember anything. He couldn't remeber who he was or how he had gotten there and he couldn't even remember oh who was the woman lying down on the sand. Time passed and he still couldn't remember, one day the town's bully picked on him, he made a run for it.n Emrys discovered something amazing...he discovered he had hidden powers! One day he couldn't take it anymore, the bully was going to hurt his "mother", he had to do something. They got into a fight and there were flames, flames caused by Emrys. When Emrys woke up he couldn't see anything...he was blind. Days passed and he couldn't take it he had to get back and find out were he was from. He needed to find out about his past. He went in search for his past, he couldn't stand feeling like he was useless he was betting himself up. That's why he wanted to know more about him, his past, and if that woman was really his mother. person vs. person. It is person vs. person because Emrys in the future runs into someone and they have some problems and he has to do something dangerous, something he didn't want to do but he had to. A major event that changed the character was when Emrys lost his vision and decided to learn about his past. When Emrys went on a quest to discover who he was everything had changed in him he was not the same emotionally and physically . He didn't stop even though he was blind he was determined to find out who he was, were he had come from. After he had lost his sight everything changed for Emrys, for him everything was dark and he couldn't tell the difference between things. My favorite part was when Emrys found courage and strength to keep going. It was my favorite part because it shows that if we really want something we can accomplish it, we just have to set our minds to it. When he keeps going even though there are many dangers it proves that he is brave, and he is also blind so it wasn't easy to go on a quest in search for who you really are. (Plot)A young boy named Emerys washes up on shore and he doesn't even know his name or where he came from. Throughout the book he is trying to figure out who he is and trying to find his real name. He travels to this different place called Fincayra where everything lives and talks. Fincayra is taken over by an evil king and Emerys trys to overthrow him and turn Fincayra to its old wonderful self. (Character Analysis)Merlin really showed his true colors when he learns that he can do magic. At firs (Plot)A young boy named Emerys washes up on shore and he doesn't even know his name or where he came from. Throughout the book he is trying to figure out who he is and trying to find his real name. He travels to this different place called Fincayra where everything lives and talks. Fincayra is taken over by an evil king and Emerys trys to overthrow him and turn Fincayra to its old wonderful self. (Character Analysis)Merlin really showed his true colors when he learns that he can do magic. At first he was really really scared about his new found ability but after a while he realizes that his powers can be used for great things. That's when he gets cocky and thinks like he owns the world. Then he gets humbled and learns that his powers are meant to help other people not himself. (Theme)In this book you can learn a great many things but the thing that is shown the most is the need of self confidence but knowing that you don't own the world. Merlin shows a great example of this because at the beginning of the book he thinks he is nothing but near the end he shows a little too much self confidence but then he gets humbled. Everyone should be like that. You should have a little self esteem but not so much that it just gets annoying. I absolutely adored this book. I usually don’t enjoy shorter fantasy novels since I seem to need 800+ pages to really become invested in a new world and new characters but this time that was not the case. There was just the right amount of travelling and we didn’t get mind numbing descriptions of every individual leaf along the way. The plot was constantly moving forward while still taking the time to build the world around you. Although it is a YA novel it is not centred around a romantic r I absolutely adored this book. I usually don’t enjoy shorter fantasy novels since I seem to need 800+ pages to really become invested in a new world and new characters but this time that was not the case. Although it is a YA novel it is not centred around a romantic relationship. There are just the right amount of typical fantasy face-palm moments. If I had to pick one it would be our poor Merlin who seems to end each chapter being somehow knocked unconscious. I am concerned by his potential for concussion related symptoms following him into the remainder of the series. I could not finish this book after five chapters; it was just so boring and icky. Dull, dull, dull. I didn't like it ok? Merlin: The Lost Years is the first installment in the Merlin Saga by T. A. Barron. The prologue is written in the third person, while the rest of the novel is narrated in the first person by a 12-year-old Merlin, or as he is called throughout the novel, Emrys. The opening lines of the story remind the reader of the popular scene when an arm rises from the water holding Excalibur. Emrys washes up on a shore, alone at first, and has no memory of who he is and how or why he got to this place. He no Merlin: The Lost Years is the first installment in the Merlin Saga by T. A. Barron. The prologue is written in the third person, while the rest of the novel is narrated in the first person by a 12-year-old Merlin, or as he is called throughout the novel, Emrys. Emrys washes up on a shore, alone at first, and has no memory of who he is and how or why he got to this place. He notices a beautiful woman also washed up on the shore and wonders if she could be his mother but feels she is too beautiful to be so. They are attacked by a wild boar and saved by a stag. This, slightly strange, beginning is explained after a few chapters. Emrys is not convinced that this is his real name and is unsure if the woman, Branwen, is his mother. Throughout the novel, he tries to find out who is he is, who is parents are and where he belongs. Emrys has powers but when he uses them, they result in more destruction than intended and he learns to fear them. Throughout the novel, Emrys considers using his powers several times but remembers the promise he made to Branwen to never use them in addition to the painful memory where he loses his eyesight. Despite being narrated in the first person, the novel moves at a fairly quick pace. Though the parts about Emrys remembering the painful memory of using his powers are frequent and feel repetitive “the smell of burning flesh...” is repeated several times. The idea of the “lost years” is resolved in the end, where Emrys, and the reader, come upon some startling revelations. Merlin: The Lost Years is a journey of self-discovery and is a good start to the world of young Merlin (Emrys). And I look forward to reading the second part of the saga, titled The Seven Songs. The story is good, but the prose is too young for me. I'd rather re-read Stewart or Lawhead. Cringe inducing author introduction followed by Book Party Foul: amnesiac main character. I suppose I should know this, but I never read those plot spoiling blurbs. Audiobook DNF. The Lost Years of Merlin is the initial installment of the five book series chronicling Merlin’s life as a boy, a prequel to Arthurian legend. It follows the ambiguous details of Emry’s obscure youth and the path he followed leading to the emergence of his magic and the wizarding name he proclaimed of Merlin. Barron’s imagineering of this portion of the great wizard’s life gives new depth to the renowned character as we see his life through the eyes of a young boy. The story opens with a dream se The Lost Years of Merlin is the initial installment of the five book series chronicling Merlin’s life as a boy, a prequel to Arthurian legend. It follows the ambiguous details of Emry’s obscure youth and the path he followed leading to the emergence of his magic and the wizarding name he proclaimed of Merlin. Barron’s imagineering of this portion of the great wizard’s life gives new depth to the renowned character as we see his life through the eyes of a young boy. The story opens with a dream sequence foreshadowing a time magic escaped his fingertips to unleash a fire kindled in Branwen’s defense (the woman claiming to be his mother) the very fire whose flames took his sight leaving him blind until he learned to use his gift of “second sight”. Emrys, now 12, is desperate to know of his past and why he has no memory of a time before five years ago when he and Branwen washed upon the shore. She claimed to be his mother but would not speak of their past or where they came from. Instead she taught him the lore of the Celts, Druids and those more ancient. She felt his lost memory was a blessing, the young boy considered it more of a curse. The pair shared a lowly hut they constructed themselves on the outskirts of a small village. Whenever anyone from the village was ill or injured, they would come to Branwen bartering for her services as a gifted healer as she was well acquainted with the old ways and herbal remedies. When in need of her services the villagers sang praises to her unique talents, but the truth of the matter was, they were afraid and thought her to be a sorceress or demon. One day the village bully came to their hut and set fire in an attempt to free the village of this “she-demon”, as he and two of his minions grabbed Branwen by the legs and began dragging her into the fire, Emrys’ fear and rage swelled within, coursing and raging as he ran forward trying to help his mother. He could not control it any longer and felt the bully, Dinatius, should burn for this. He could envision the fires and wished they would consume the bully. At the thought, an enormous tree branch shuddered and cracked as if struck by lightening; it fell upon the young bully trapping him as the branches exploded into flames. As the spine shivering shrieks erupted from the inferno Emrys knew what he had done as he plunged into the flames trying to save the boy. His dream vision had come to pass. As the young half-blind Emrys struggles to learn the secrets of his past, the magic within him, and his true identity he comes to the realization he must leave this place, returning to the place he had washed upon the shore to make the attempt to voyage back to the mist-shrouded isle of Fincayra, an enchanted isle that lies between earth and sky. He asks the woman who calls herself his mother to join him in his quest. With great sadness she declines, but takes a jeweled pendant from her neck, presenting it to him. She calls it the Galator and tells him its power is great – if it cannot keep him safe it is only because nothing outside of heaven can. Mighty waves crashed over his feeble raft tossing it about as a mere twig on the outraged sea. The storm swelled and he thought about calling upon his powers to save him but after the last fiery encounter with his magic, he became less afraid of the violent storm than trying to unleash a magic he might not be able to control. The waves pounded over him and when he felt he could hold onto his little wooden raft no more the mysterious shrouded isle appeared and he is again washed upon the shore. As he comes to and regains a bit of strength he ventures further into the strange land. The colors are so vivacious he can sense them, even through his half-blinded eyes. He can feel the plushness of the forest floor and he meets a merlin, its wing broken in battle with a rat, a strange girl of the forest called Rhia, and a tiny but brave giant named Shim. Emrys discovers that blight has come upon the isle that is somehow entwined with his own destiny. He must decipher the riddle of the dance of the giants to change the fate of this land and discover the secrets within himself. This is an engaging and enjoyable tale you will want to experience many times over. It explains the roots of the greatest wizard of legend and myth in an epic saga filled with wonder and adventure. Que jovem nunca desejou ser uma personagem, um confidente ou um mero ajudante numa qualquer aventura ímpar de um dos maiores magos de todos os mitos e lendas? Que sonhador nunca ponderou acerca da ideia imaginária de espalhar magia por um mundo que, demasiadas vezes, se vê perpetrado pelas trevas? E que mente desperta nunca antes idealizou a infância, a juventude de alguém que admira, ou de alguém cujo um dia gostaria de ser? Merlin – Os Anos Perdidos é a resposta a todas as preces juvenis cuja curiosidade em torno de tão enigmática figura mítica, o próprio Merlin, pode vir a tornar-se perigosamente viciante. Esta é, também, e possivelmente, a mais bem elaborada e deliciosamente criativa abordagem aos tão desconhecidos tenros anos desta personagem. T. A. Barron sabe captar o interesse do seu público alvo, com afiadas garras e sedentos dentes, e não fosse eu uma leitora já tão demasiado exigente, dúvidas não me restam de que esta viagem, esta leitura teria sido um autêntico deleite para os sentidos. I really think that the whole foundation for this story and series is really solid, especially in relation to the title, which I think is perfect. The Lost Years of Merlin, where he is not only kind of lost, wandering around wondering where he belongs, but these stories of his youth have been lost to time as well. And Merlin's youth, be him the wizard or simply wise man of King Arthur lore, has got to be one of the most interesting parts of the story, though one we know nothing about. Barron's t I really think that the whole foundation for this story and series is really solid, especially in relation to the title, which I think is perfect. The Lost Years of Merlin, where he is not only kind of lost, wandering around wondering where he belongs, but these stories of his youth have been lost to time as well. And Merlin's youth, be him the wizard or simply wise man of King Arthur lore, has got to be one of the most interesting parts of the story, though one we know nothing about. Barron's twist on placing him outside of our world and part way into another to learn about other worlds and his own magical abilities, is a nice one that I enjoyed. The world of Fincayra is typical of a fantasy land, with goblins, giants, evil black shadows and talking trees, and the story is fairly standard as well, with a fast-paced story and characters with questionable motives who help but also threaten to harm our hero. I can see the dwarf giant Shim as a Jar-Jar Binks type of character, especially with the way he talks and is always scared but trying to be brave. The merlin Trouble is probably one of my favorite characters in that what he's thinking never has to be explained. I adore these books. Don't let the thought of "young adult" dissuade you from reading them. I read them the first time when I was 13, re-read them again at 18, and now at 23 own them and read them for leisure at various times when I'm in between quality books. They're chalk full of fascinating characters, plot twists, enriching and exotic places, evil villains, beautiful love stories...these five books have it all. In my humble opinion, they're books that don't come along often. I wish they had I adore these books. Don't let the thought of "young adult" dissuade you from reading them. I read them the first time when I was 13, re-read them again at 18, and now at 23 own them and read them for leisure at various times when I'm in between quality books. They're chalk full of fascinating characters, plot twists, enriching and exotic places, evil villains, beautiful love stories...these five books have it all. In my humble opinion, they're books that don't come along often. I wish they had extended for hundreds of more pages so I could continue to enjoy this world. Obsessed with these books. não gostei por ai alem. não consegui de facto sentir empatia pelos personagens, pelo que a historia em si não me seduziu minimamente. apesar de a escrita ser fluida e os personagens bem caracterizados, o tema não é para mim garantia de uma boa historia. This fantasy novel is rich with creative and lovable characters and a lush environment that will instantly draw you in. The book begins with excitement and mystery, intriguing you to read further. I can't wait to continue on with this series! Barron's writing is fun and he paints a great story of his theory on Merlin's young adult years. Encontré estos libros de churro en la librería, hace unos años, nada más compré el primero para ver qué tal estaba y no me duró ni un día. Es la historia de Merlín cuando muy joven. El muchacho queda ciego y debe aprender a ver con su ojo interior, y es así como empieza a descubrir que puede ver mucho mejor y puede hacer muchas más cosas. In this excellent tale of the wizard between the mortal and divine, voices appear in Merlin's head and he wants his memory back to know who and what he is. Later Merlin learns, like Luke Sky Walker in Star Wars, that his father is the evil one. It is in Chapter 4 "Sacred Time" that Merlin recreates the classic myth of the eternal return, rebirth. 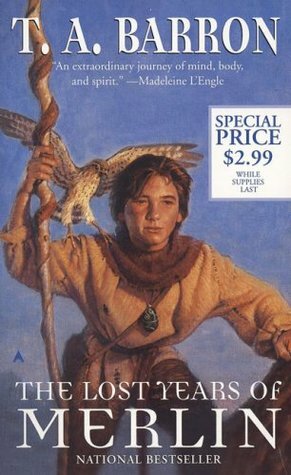 I found this series when I was 11 years old and I couldn't read them fast enough. Here, more than 10 years later, i'm still so very disappointed in myself for not making all of them my own. They all are enriched with the values of friendship, family, courage, and of course magic. I always envisioned it as a pre-harry potter series, even though I discovered it after I began the HP series. I loved the idea that the author chose to write. It takes great imagination to invent a world and characters that create the beginnings of a character that has been written about for so long. I found the narrative compelling as well as believable. Recommends it for: Any one who likes stories about merlin. This was a good book that tells a good story about the early years of Merlin. It gives you an idea about how he came to the name Merlin as well as how he learned his magic, and why he was gone from history during those early years. I've read the whole series and I love it, the fantasy aspect and the amazing characters will hook you on the series really quickly. Watching his journey as he grew older was magical. I hope he finds out about his past. T.A. Barron grew up in Colorado ranch country and traveled widely as a Rhodes Scholar. He is the winner of the de Grummond Medallion for “lifetime contribution to the field of children’s and young adult literature” and many other awards. T. A. Barron is the author of more than 30 highly acclaimed books, many of which are international bestsellers. They include The Lost Years of Merlin (now being d T.A. Barron grew up in Colorado ranch country and traveled widely as a Rhodes Scholar. He is the winner of the de Grummond Medallion for “lifetime contribution to the field of children’s and young adult literature” and many other awards. T. A. Barron is the author of more than 30 highly acclaimed books, many of which are international bestsellers. They include The Lost Years of Merlin (now being developed into a feature film), The Great Tree of Avalon (a New York Times bestselling series), The Ancient One (the tale of a brave girl and a magical tree), and The Hero’s Trail (nonfiction stories of courageous kids). “As the wind swelled, my tree started to sway. Almost like a human body it swung back and around, gently at first, then more and more wildly. While the swaying intensified, so did my fears that the trunk might snap and hurl me to the ground. But in time my confidence returned. Amazed at how the tree could be at once so flexible and so sturdy, I held on tight as it bent and waved, twisted and swirled, slicing curves and arcs through the air. With each graceful swing, I felt less a creature of the land and more a part of the wind itself. "The rain began falling, it's sound merging with the splashing river and the singing trees. Branches streamed like waterfalls of green. Tiny rivers cascaded down every trunk, twisting through moss meadows and bark canyons. All the while, I rode out the gale. I could not have felt wetter. I could not have felt freer.